Parkinson’s disease (PD) is the second most common neurodegenerative disorder, after Alzheimer’s disease. The prevalence of Parkinson’s disease dementia (PDD) is roughly estimated to be around 30 %, while PDD will occur in over 80 % of patients after 20 years of disease, conferring an important impact on patient management and prognosis. The main clinical syndrome of PDD is that of a frontal-subcortical dysexecutive visuospatial impairment, as well as neuropsychiatric features such as hallucinations and delusions and thus quite similar to that of dementia with Lewy bodies (DLB). The etiopathogenesis is unknown, but α-synuclein pathology spreading from the brainstem to the neocortex is involved, and it seems that concomitant Alzheimer’s disease pathology, in particular Aβ plaques, is crucially implicated. Moreover, genetic factors have been recently highlighted as important pathogenetic factors. The diagnosis is based on clinical diagnostic criteria for PDD and mild cognitive impairment. There is no neuroprotective or disease-modifying treatment for PDD. The best evidence for symptomatic treatment exists for the acetylcholinesterase inhibitor, rivastigmine. With regard to dementia in atypical parkinsonism, much less is known. 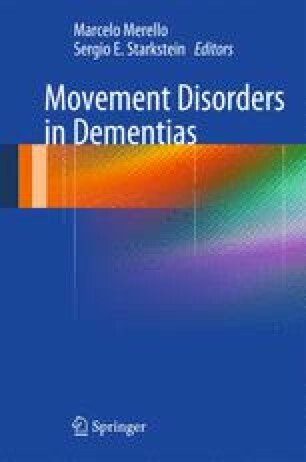 The prevalence of dementia in progressive supranuclear palsy (PSP) and corticobasal degeneration (CBD) is high and impairs quality of life in these patients. The cognitive profile reflects that of a frontal-subcortical dysfunction in PSP and additionally parietal dysfunction in CBD, while memory is in both conditions relatively preserved. Apathy, depression, and disinhibition are the most common neuropsychiatric features, while hallucinations and delusions occur extremely rarely. Tau pathology in the cortex and subcortical structures seems to correlate with these cognitive phenotypes; however, the understanding of the pathophysiology as well as treatment options is limited. In contrast, dementia in multiple system atrophy (MSA) still counts as one of the exclusion criteria for its diagnosis. Recent studies have highlighted that executive dysfunction does occur in MSA, but etiopathogenesis and treatments are still to be researched. Höglinger GU, Huppertz HJ, Wagenpfeil S, et al. Del Ser T; for the TAUROS MRI Investigators. Tideglusib reduces progression of brain atrophy in progressive supranuclear palsy in a randomized trial. Mov Disord. 2014. doi: 10.1002/mds.25815.